Please note: The images we’ve used in creating these memes are courtesy of talented Scottish, Irish, Welsh and American photographers who have been kind enough to either grant us permission or licence these as Creative Commons on Flickr. The Creative Commons licence they have been released under means you are welcome to share these images on your social media freely, provided you give credit to the original photographer and a link back to the CC licence, as we have done. And tales till morning from the guest. The baking of the Strùthan Mhìcheil (a special bannock bread) is one of the major focuses of Là Fhèill Mìcheil. As the ingredients are mixed together, and then as the bannock is shaped, a blessing is said, either to Michael or to the spirits you honour at this time. 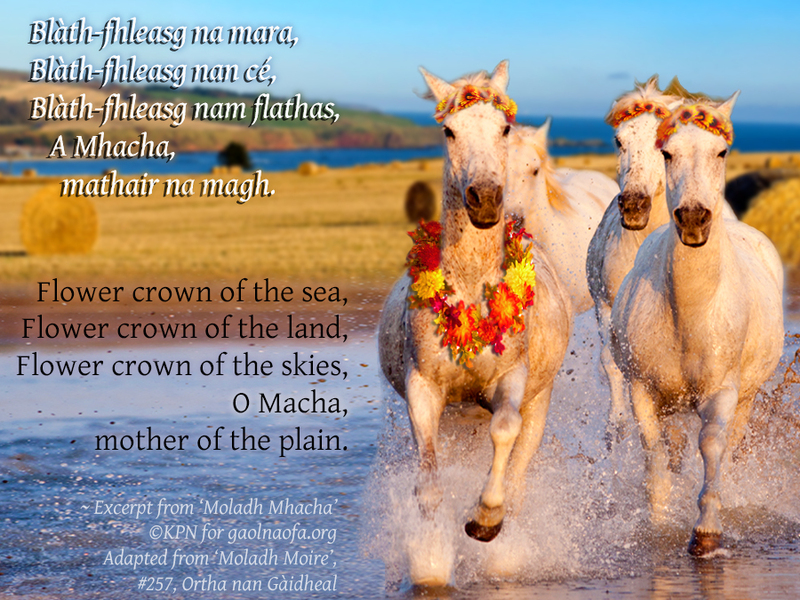 O Macha, mother of the plain. A Mhacha, mathair na magh. As seen in our Michaelmas video, the feast of St. Michael on Sep. 29 preserves many seasonal Gaelic customs, though they are mostly the same as ones observed at Lá Lúnasa or Oíche Shamhna in other regions. 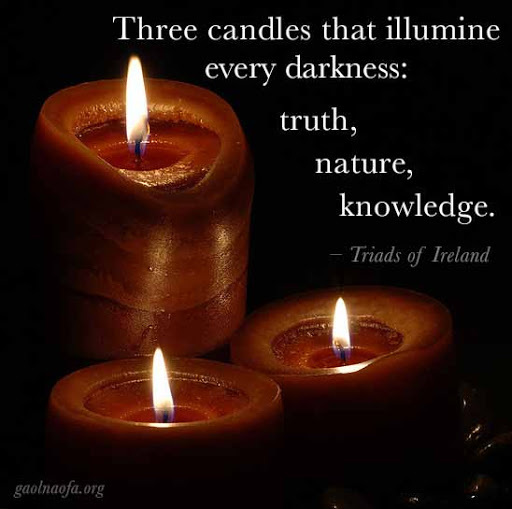 Pre-Christian deities whose qualities were inherited by Michael include Macha and Manannán. Manannán already has his own festival at Midsummer. While many of us honour Taillte at Lúnasa, and the Morrígan at Samhain, perhaps Macha also deserves a festival of her own: Lá Fhéile Mhacha. 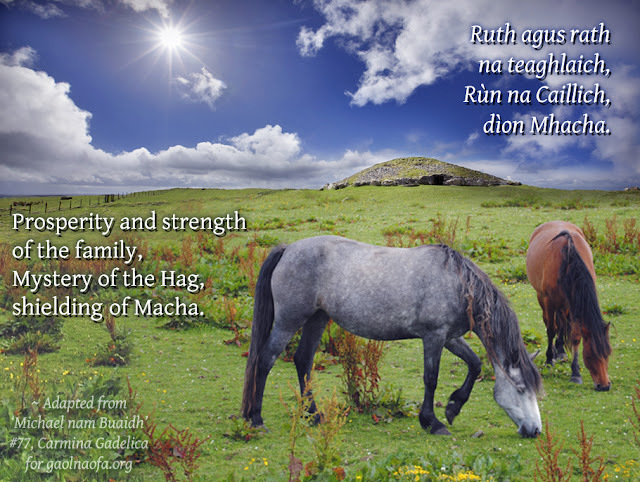 Like Michael, Macha is also associated with horses and the fields, and the traditional horse races held at this time could be dedicated to her, along with the swimming of the horses, the walking or riding the boundaries of the fields, and the baking and offering of the bannock/strùthan. The Cailleach is also relevant now due to the equinox sunrise illuminating the inner chamber at Sliabh na Caillí/Loughcrew in Ireland. The last sheaf of the harvest is called the Cailleach, and the Cailleach an Dudain (“The Old Woman of the Mill”) dance is also traditional at this time. Which deities we honour at these festivals can vary a bit with our differing bioregions, as well as which deities we have more affinity with and other factors that affect our households. Whoever you honour at this festival, we wish you a good one! 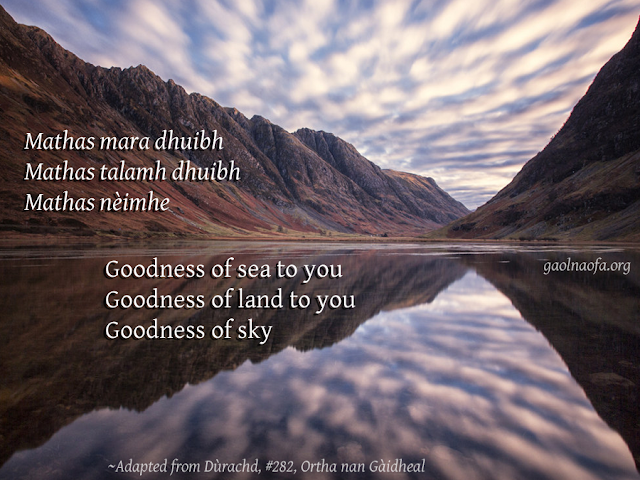 From Alexander Carmichael’s Ortha nan Gàidheal: The Carmina Gadelica Volume III (1940), song 304, titled ‘Geaslanachd na Gealaich’ (‘Moon Worship’). The moon is a beautiful and welcome sight in the night sky, and in the days before street lights it was also an important one, providing some light to guide the way for travellers. There are many traditions surrounding the waxing and waning of the moon, some of which are detailed by Carmichael in the notes accompanying this prayer. 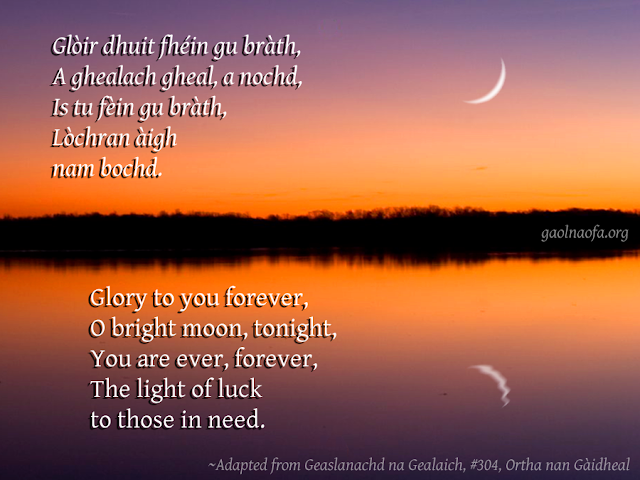 There are also (and especially) traditions surrounding the first sighting of the new moon – the first new sliver of the waxing moon as it appears in the sky – which we have covered in our video on A’ Ghealach Ùr – The New Moon – where we describe how Gaelic Polytheists may observe the new moon with prayers and offerings. (Original link). Any meeting that produces peace is good. Dùrachd (“Good Wish”) from Alexander Carmichael’s Ortha nan Gàidheal: Carmina Gadelica Volume III (1940). 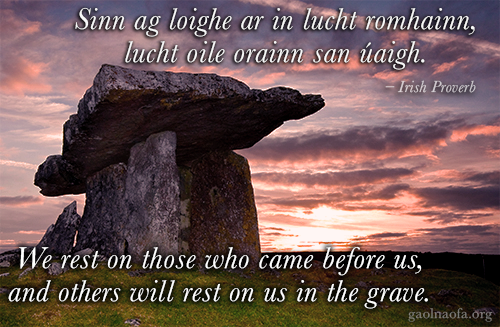 and others will rest on us in the grave. Trí caindle forosnat cach ndorcha: fír, aicned, ecna. 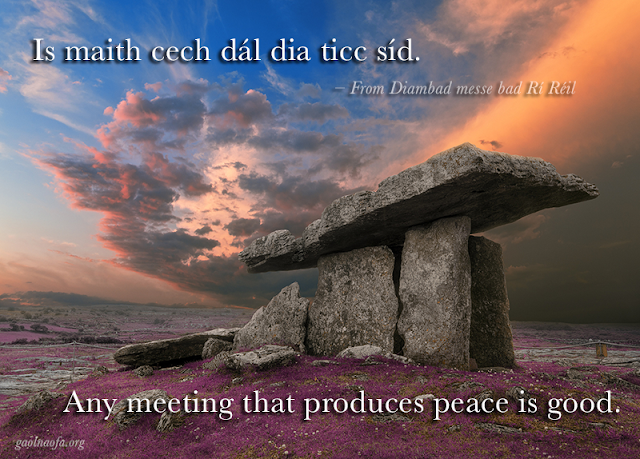 * Adapted from the blessing of the strùthan in ‘Michael nam Buaidh, #77. * Adapted from ‘Moladh Moire’ , #257, by KPN for NNC and GN. * Fliosg is not in Dwelly’s or other Gaelic dictionaries. I think it’s a typo on fleasg, which can mean garland, wreath, fillet or crown. * The modern Gaelic plural of the Old Gaelic / Old Irish mag or magh is maighean. 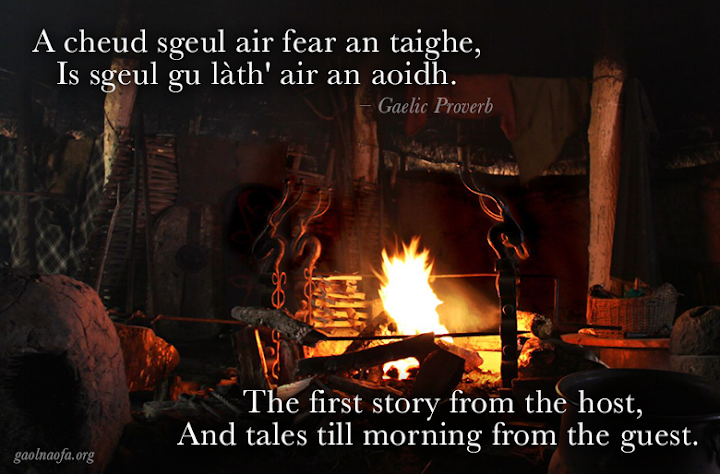 While Carmichael’s archaic Gaelic often includes words in older forms of Irish – including plurals formed in this way that would allow for the better-sounding nam maigh for “of the plains” – unless you have footnotes or the chance to explain your choices beforehand, you will probably confuse people if you insert these archaic forms into modern Gaelic. In the singular, the “plain” that is referred to could be the great Plain that is Ireland, or the plain of Mag Mell. In English the mind tends to translate it to “plains”, but the singular works in the original mindset. To rhyme better with cé, you could use poetic license and go with the Older form in private. * àrois is also misspelled. Corrected to àrais. * Original has “pàrrais,” genitive of pàrras, – paradise. Changed to Magh Meall, Gaelic spelling of OI Mag Mell, the Plain of Joy, one of the names of, or places in, the Otherworld. For more on how we adapt traditional prayers (and check them for transcription or translation errors), see our Prayer article.